The faith of Taakatism today chose a new leader in a closed ceremony which only followers of the faith were allowed to attend. According to their website, the ‘International Taakatism Association’, which claims to represent Taakatists worldwide, elects a new leader (called a ‘Shikara’) every 8 years. Unfortunately, due to the closed nature of the ceremony, we at TSW have no way of knowing how this leader is elected. This process is not mentioned on their website. The new Shikara is a man called Sanjay Bhatt, a second generation immigrant to the UK from India. He takes over from the last one, a man named John McManus. 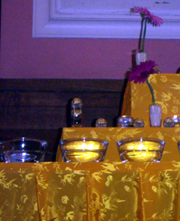 A Taakatism ritual involving candles, bowls of water and flowers. Taakatism claims to represent a lineage of Indian teachers going back 500 years. There has however been controversy with this group recently regarding their belief in the since disproven claims made by Dr. Masaru Emoto regarding emotions and prayer having effects on water. This entry was posted on Friday, July 8th, 2011 at 10:53 am	and tagged with controversial, india, taakatism, uk and posted in Uncategorized. You can follow any responses to this entry through the RSS 2.0 feed. The Spiritual Week has a new home!